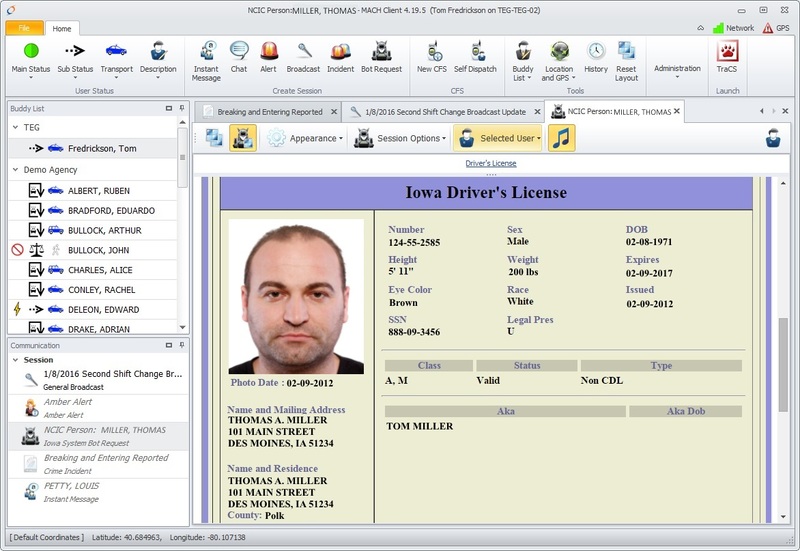 TraCS is the award winning data collection, records management, and reporting software for public safety professionals. TraCS provides the tools and functionality to record, retrieve, and manage incident information wherever and whenever needed. 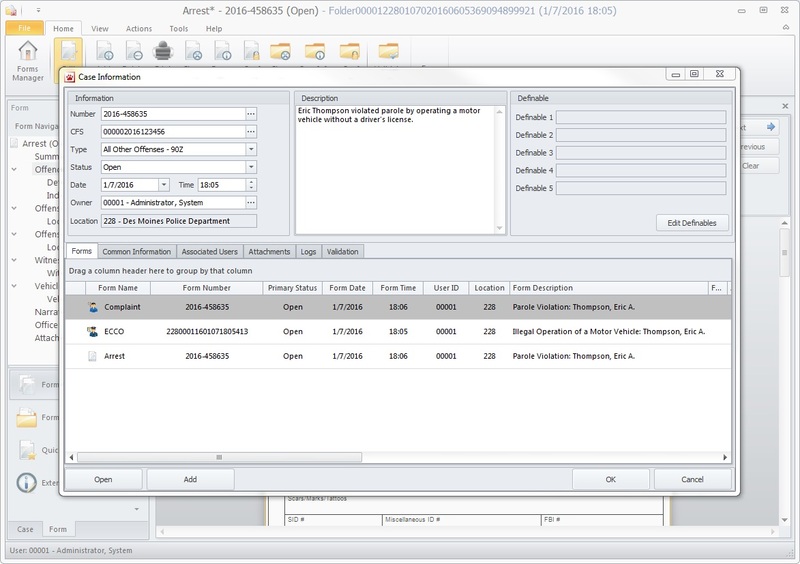 From e-Citations and e-Crashes to Arrest and Incident reports, TraCS is the preferred solution for public safety agencies across North America. Case attachments to store Word and PDF documents, video and audio files, and other file types directly with your case. Validation rules at the case level make sure all of the pieces of the case are completed correctly. 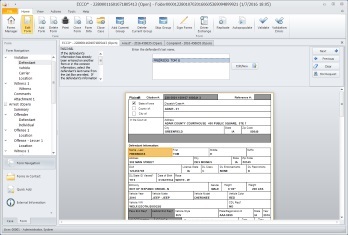 Use both TraCS and TraCS Web devices to meet your agency's unique connectivity needs. 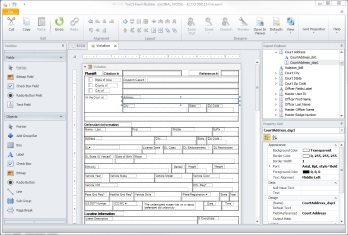 Build new forms, reports, and validation rules to use in your agency. Get an overview of your current cases, unfinished work, and To Do list through your personalized TraCS dashboard. 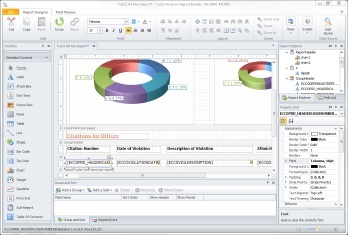 Create new reports or edit existing ones. Ensure your work is complete and accurate before submitting it for approval. 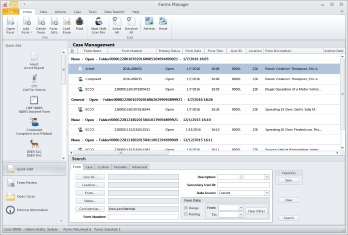 Manage your open cases, add information, and update statuses. Prepare documents for prosecuting the case in court. 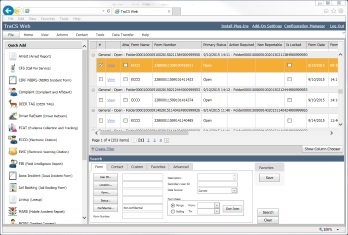 Use all of the functionality of TraCS in a web-based deployment. 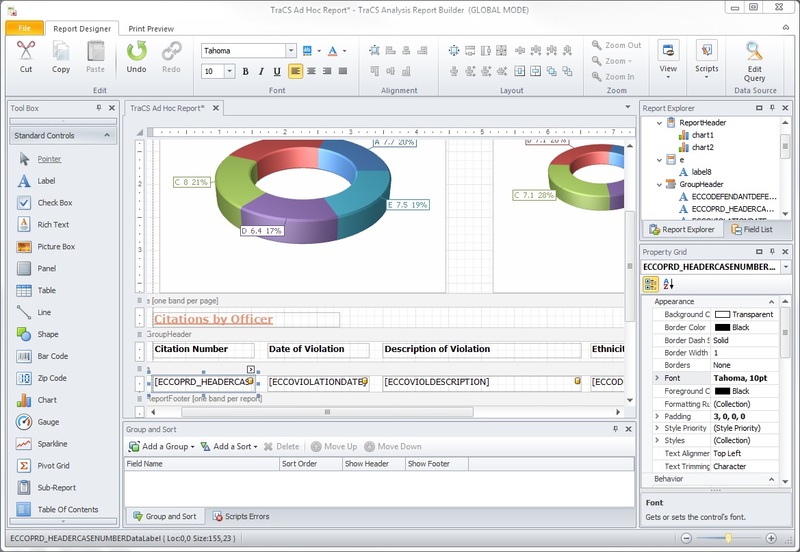 Enjoy the same look and feel of TraCS in any browser. 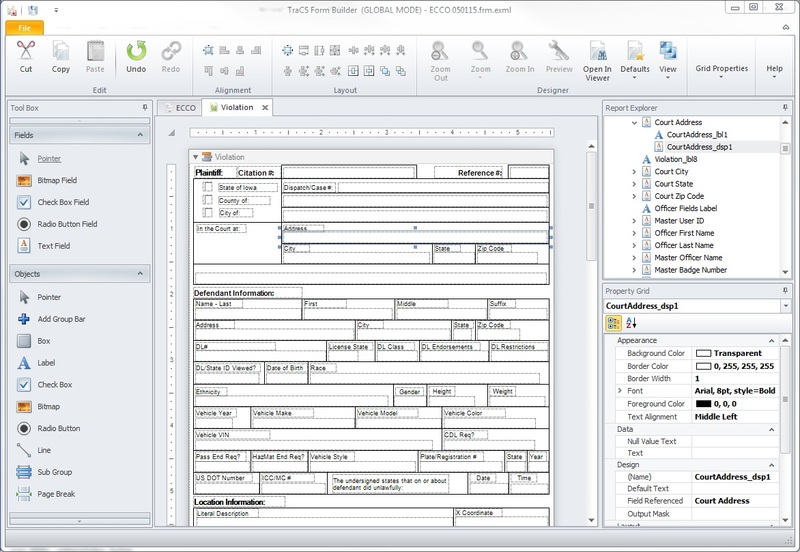 Build new forms, reports, and validation rules and completely customize TraCS to fit the way your agency already does business. Analyze your agency's data by creating advanced statistical reports and plotting the results on a map for visual representation. 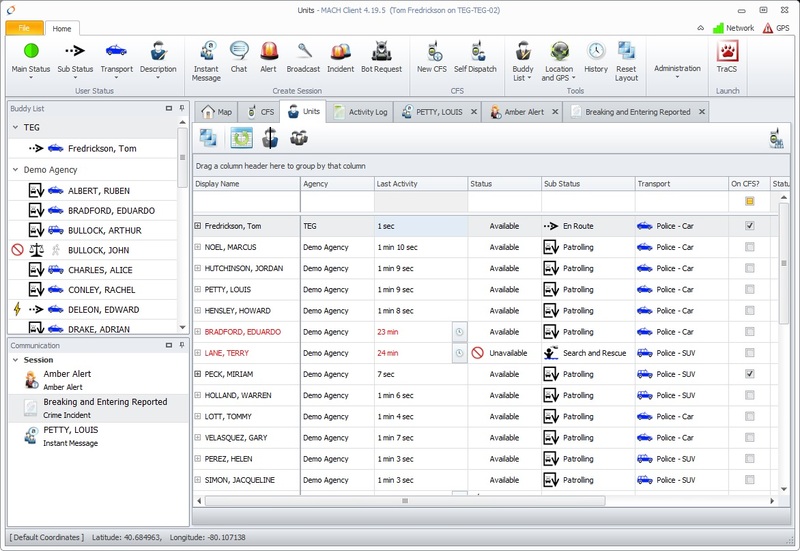 TraCS is a scalable enterprise public safety software solution that allows you to maximize the value of your agency's information. Reduces paperwork that takes away from valuable patrol time. 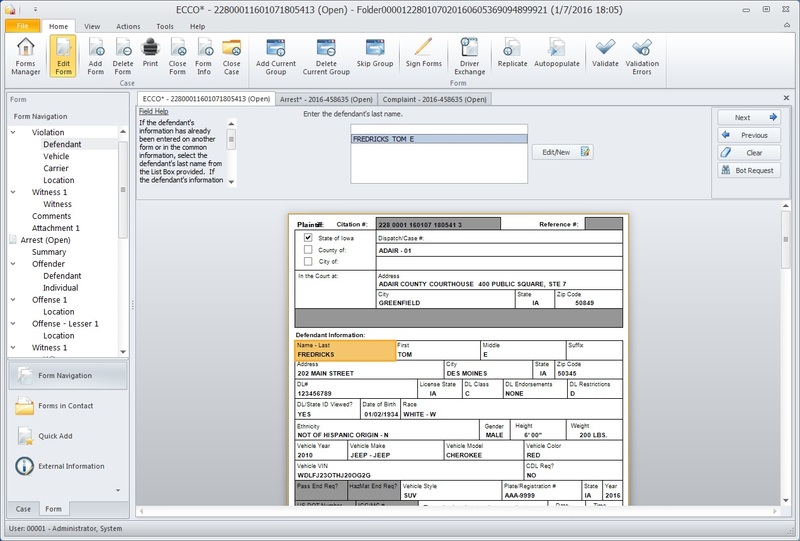 Eliminates messy handwriting, misspellings, and incomplete or incorrectly filled in forms. Allows data to be collected in the field where the incident happens instead of after the fact back at the office. Numerous data input devices including barcode readers, magnetic stripe readers, and signature tablets make collecting information fast, easy, and accurate. Complete Incidents, Investigations, Arrests, e-Citations, e-Crashes and many, many more forms and reports. 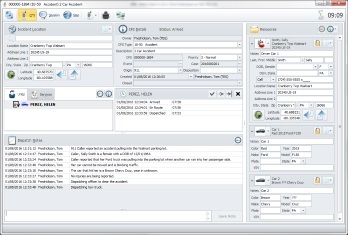 Seamless interface to MACH for a complete mobile silent dispatching solution, NCIC/NLETS queries, wireless access to the TraCS database directly from the car, and point and click map-based location of incidents. Allows collected data to be transmitted to state and federal agencies automatically in any format necessary including GJXML, NEIM, and NDEx. 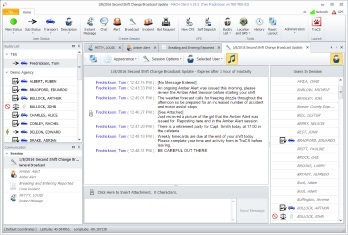 MACH is the next generation of collaborative command and control software for public safety professionals. MACH utilizes an innovative internet communications architecture that allows users and agencies to share information for facilitating cooperation and organization during every day activities and emergency events. Custom map zones for easy dispatching - Jurisdiction, County / Municipal boundaries, etc. Don’t bother dispatch. Run searches directly from your computer. 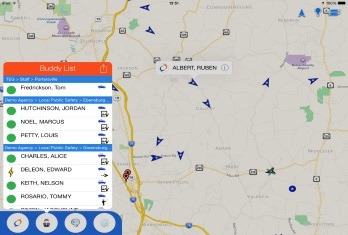 See all units and their locations from any MACH device no matter where you are. 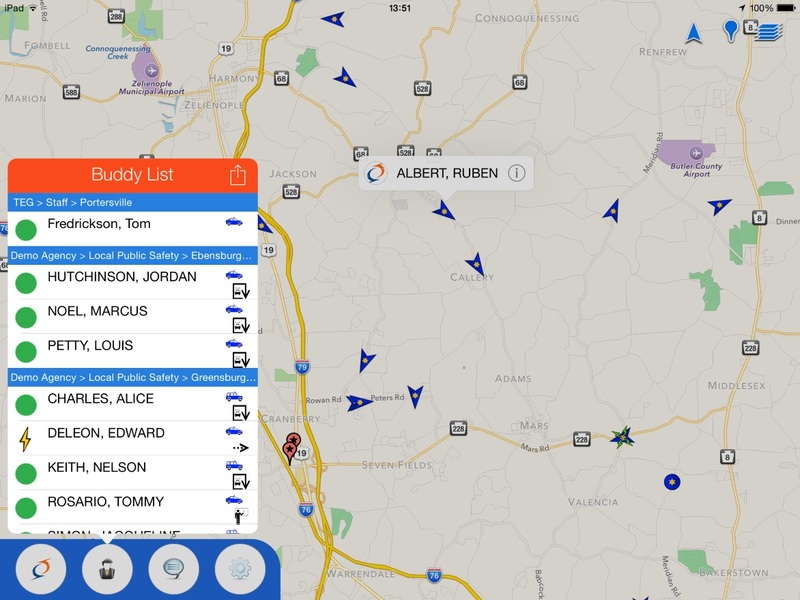 Add map layers for traffic cameras, high crime areas, disabled vehicles, and many others. 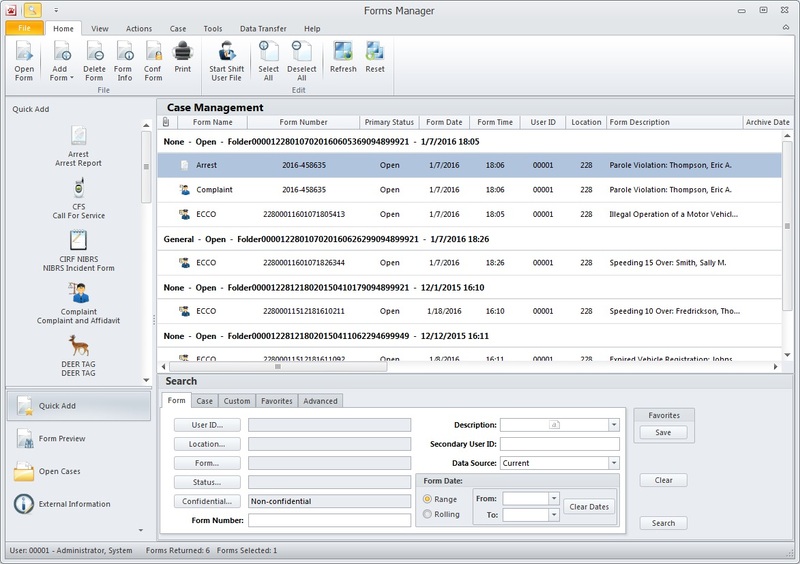 Quickly view a list of all available units, thier statuses, and the call for services they are on. 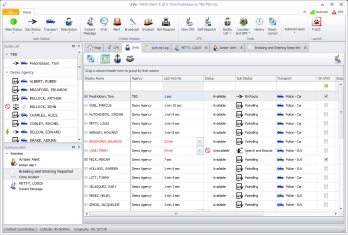 Check in on low activity units to ensure everything is OK.
Use MACH's high-volume, enterprise level CAD system to take calls for service and dispatch units. Interface MACH with your e-911 system for automated CFS entry. 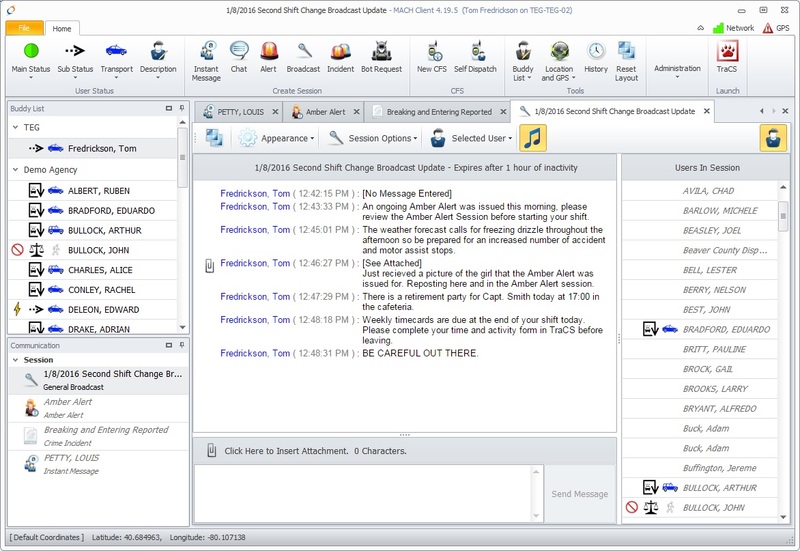 Communicate user to user or chat with groups of users within your agency or with other agencies. 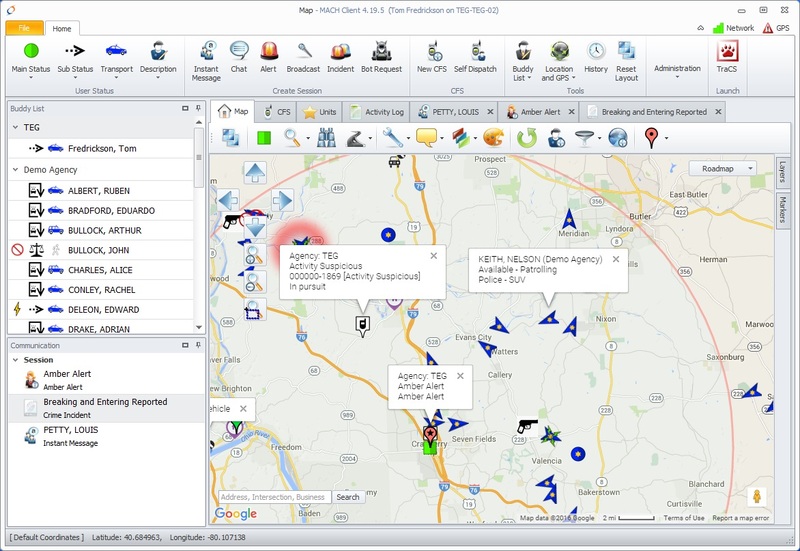 MACH makes agency interoperability and cooperation easy. 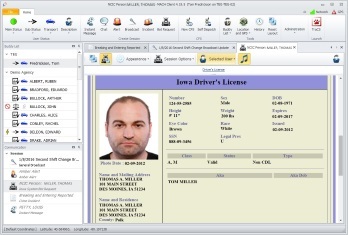 Create MACH BOTS to interface with other systems including your state switch for driver's license and registration data to be used in MACH and on TraCS forms. Take all of the features of MACH with you. MACH for iOS and MACH for Android give you complete mobile access when out of the office and when you leave your vehicle. 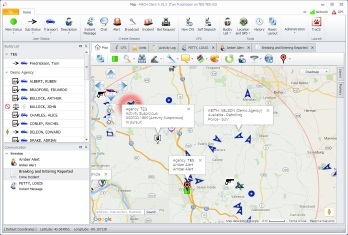 MACH is a central communications and mapping software platform for use by public safety professionals to collaborate and enhance operations during everyday activities and emergency incidents. Cross agency communication and collaboration. Enterprise high-volume computer aided dispatching. Command and communication center arena-view of all resources including law enforcement, EMS, fire, and DOT/highway. 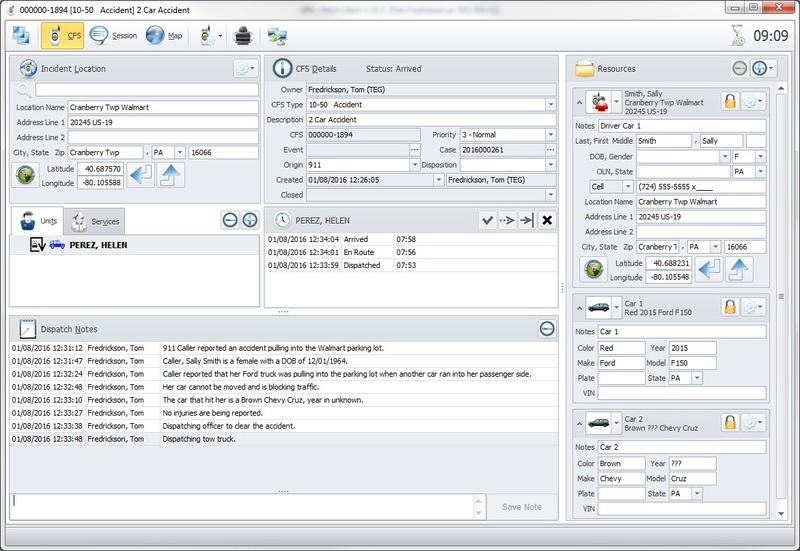 In-car session based view so that field personnel have the same information available to them that command does. Google Maps provide up to date road and satellite views as well as all of the other features you have come to rely on from Google. 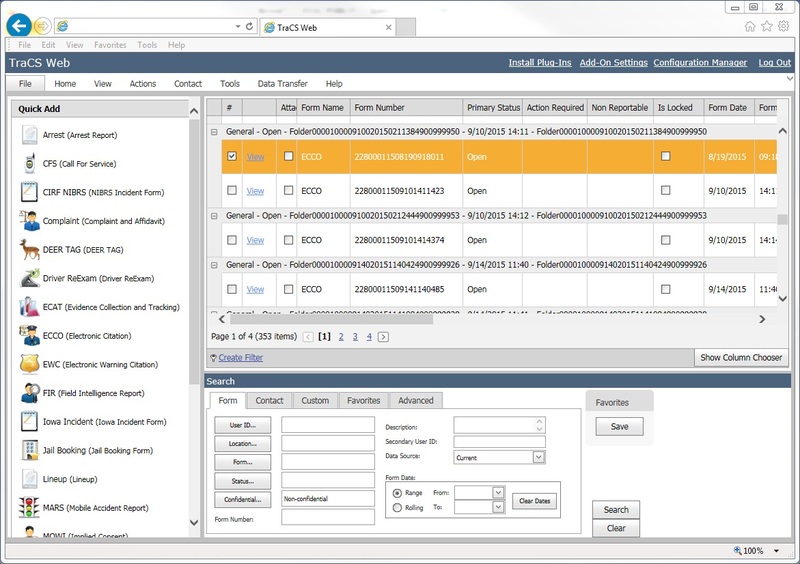 MACH interfaces with TraCS for a complete mobile desktop solution.